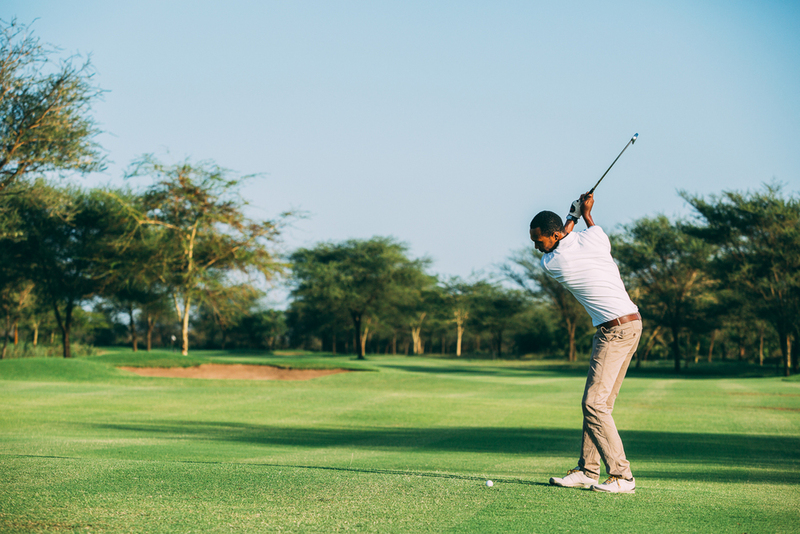 The Kilimanjaro Golf Club is the first 18-hole championship golf course in Tanzania, geared to host local and international golf events, tournaments and club nights. The presentation of the course is highly unique, with each hole blending effortlessly in to the natural canvas of the terrain. Indigenous plants, native grasses and trees add to the individuality of the landscape, providing golfers with a once-in-a-lifetime experience. The greens are large, with subtle changes in elevation as the location demands. All are built to USGA specification; the accepted standard for high quality surfaces throughout the world. Bunkers have been strategically placed to allow golfers a fair route to the fairways and greens. The clubhouse itself sits slightly raised above fairway and green levels. At the nearby driving range, players can enjoy the spectacular view of Mt Kilimanjaro whilst practicing their shots. From sundowners on the 16th Tee Box to Bush Dinners in Kiligolf we offer new and exciting ways to enjoy Kilimanjaro Golf & Wildlife Estate. We have introduced a new menu at the club which has been a success so far! The menu is available everyday upon order at the Clubhouse, no need to book in advance. Another exciting addition we have to the Kiligolf Clubhouse is an African Menu, where you can experience local Tanzanian dishes with a gorgeous view of the golf course and Mt. Kilimanjaro! The African Menu is available any day on a reservation basis with a minimum of 6 people per booking for 20,000/= TSH per person. We also offer Curry Lunches everyday upon reservation with a minimum of 6 people per booking for 20,000/=TSH per person, perfect for a lovely Sunday lunch after a round of golf! Fancy enjoying a tasty sundowner and snacks on the top of the 16th Tee Box? Or a delicious Bush Dinner on the Estate? We offer both on a reservation basis with a minimum of 6 people per booking. The price for Sundowners is $16+VAT per person plus drinks as per consumption. For prices on the Bush Dinners please contact us for further details. Kids under the age of 14 years play free with supervision from an adult (please make suer the adult is a golf player or has knowledge of golf rules and etiquette). If the adult is a non-member and would like to play they will need to pay green fees at the reception. Santa is coming to Kiligolf on the 15th of December! Don't miss out on a fun filled afternoon and evening for the whole family. We are offering a wonder Christmas Buffet for all to enjoy after some lovely Carol singing! For more details please do not hesitate to contact us. The first nine tees off just beside the clubhouse with the very first green bordering a lake surrounded by acacias. The second hole runs the length of one of the largest lakes on the course, of which the various levels are separated by small waterfalls and cascades. The course then loops around to its highest point before returning to the club at the ninth; a beautiful and demanding par five, played along the stream on the left with an option to lay up for two or aim for the green across the lake. The championship course has been designed to accommodate all abilities. With four sets of tees at each hole, it can be played at a championship length of approximately 6,500m down to a gentler 5,400m.